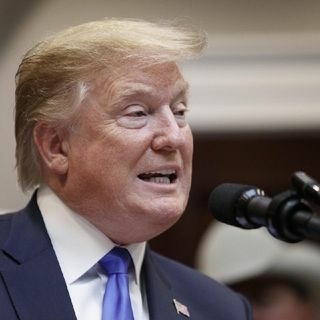 TWITTER URGED TO SUSPEND DONALD TRUMP AFTER PRESIDENT ACCUSED OF ‘SHARING PROPAGANDA VIDEOS TRAFFICKING IN HATE SPEECH’ OVER OMAR ATTACK #MAGAFirstNews with @PeterBoykin U.S. TWITTER URGED TO SUSPEND DONALD TRUMP AFTER PRESIDENT ACCUSED OF ‘SHARING PROPAGANDA VIDEOS TRAFFICKING IN HATE SPEECH’ OVER OMAR ATTACK By Christina Zhao On 4/14/19 at 6:05 PM EDT US President Donald Trump delivers remarks on 5G deployment in the United States on April 12, 2019 in Washington, DC. The Women's March ... See More launched a petition on Saturday to get Twitter to suspend President Donald Trump's account after the president posted a video attacking Democratic congresswoman Ilhan Omar.PHOTO: TOM BRENNER/GETTY IMAGES The Women’s March—a women-led rights advocacy group—urged Twitter to suspend President Donald Trump’s account for posting a video showing Democratic Rep. Ilhan Omar intercut with footage of the September 11, 2001, terrorist attacks. Trump on Friday — and then again on Saturday — shared a clip of Omar speaking at a banquet in California hosted by the Council on American-Islamic Relations (CAIR) last month, with the caption “WE WILL NEVER FORGET!” In the footage, Omar can be seen saying "CAIR was founded after 9/11 because they recognized that some people did something,” edited alongside footage of the 2001 attacks on the World Trade Center and the Pentagon. Omar’s out-of-context words were taken from a speech where she said: "Far too long we have lived with the discomfort of being a second-class citizen, and frankly, I’m tired of it, and every single Muslim in this country should be tired of it…CAIR was founded after 9/11 because they recognized that some people did something and that all of us were starting to lose access to our civil liberties." CAIR was actually founded in 1994, but did grow significantly in prominence in the years after the 2001 attack. “@realDonaldTrump is sharing propaganda videos trafficking in hate speech and inciting real violence against @IlhanMN. We’re calling on @jack to suspend him from @Twitter. Seriously. Add your name here:” the Women’s March tweeted, alongside a link to a petition to “suspend Trump from Facebook and Twitter.” “Trump has launched a despicable and irresponsible attack on Congresswoman Ilhan Omar, sharing a propaganda video questioning the Congresswoman's loyalty to the United States,” the petition’s description read. “This is as dangerous as it is unprecedented. Representative Omar is receiving countless death threats as the president of the United States is inciting violence against a Black Muslim sitting member of congress, putting her life at risk.” The petition, which urges Facebook founder Mark Zuckerberg and Twitter CEO Jack Dorsey to “take down Trump’s hateful video and permanently suspend his account,” has gathered over 9,000 signatures since it was launched on Saturday evening. Speaker of the House Nancy Pelosi, Rep. Alexandria Ocasio-Cortez (D-N.Y.), and Sens. Bernie Sanders and Elizabeth Warren, were among several Democrats who have condemned the president’s controversial video. “Members of Congress have a duty to respond to the President’s explicit attack today. @IlhanMN’s life is in danger. For our colleagues to be silent is to be complicit in the outright, dangerous targeting of a member of Congress,” Ocasio-Cortez tweeted on Saturday evening. “We must speak out. ‘First they came…’” Pelosi issued a statement on Sunday demanding Trump remove the “dangerous” post and announcing that she has taken measures to ensure Omar’s safety. “Following the President’s tweet, I spoke with the Sergeant-at-Arms to ensure that Capitol Police are conducting a security assessment to safeguard Congresswoman Omar, her family and her staff. They will continue to monitor and address the threats she faces,” Pelosi said. “The President’s words weigh a ton, and his hateful and inflammatory rhetoric creates real danger. President Trump must take down his disrespectful and dangerous video," she added. Trump, who pinned the video to the top of his Twitter feed on Saturday, re-tweeted his post a day later but appears to have removed the pin by Sunday evening The original video remains on his Twitter feed as of Sunday afternoon. The White House did not immediately respond to Newsweek’s request for comment. Despite repeated calls and petitions accusing Trump of violating Twitter policies, the social media platform has resisted taking any action against his account. In a January 2018 blog post, the company explained — without naming Trump — why it does not hold world leaders to the same standards it holds private citizens. "Blocking a world leader from Twitter or removing their controversial Tweets would hide important information people should be able to see and debate," wrote the company. "It would also not silence that leader, but it would certainly hamper necessary discussion around their words and actions." In an August 2018 interview with Buzzfeed, Dorsey made basically this same argument, though he did seem to indicate that the president could cross a line of accceptability if he attacked a private citizen. "I do believe private citizens versus public figures deserve more of our protection, but it has to be done in the context of how we’re actually seeing our global leaders," said the CEO. In that same interview, Twitter’s Legal, Policy and Trust & Safety Lead Vijaya Gadde was not as forgiving about things a world leader could say on Twitter. RELATED STORIES Nancy Pelosi Orders More Omar Security Over Trump Tweet How Pete Buttigieg Plans to Reach Rural Voters Trump Congratulates Tiger Woods On Masters Win Rick Scott: Trump 'Sanctuary City' Threat is Trolling "I think that if you asked me very directly, like, 'is everything the president says, part of public interest?' I would say no, but if you asked me what’s not, I think that it’s going to be evaluated on a case-by-case basis using the criteria we set forth," Gadde clarified to Buzzfeed. "I agree that it is subjective and nuanced and I would like to build more framework around that so we have a more consistent way to enforce going forward."